I read my novels a gazillion times before they go to print. And yes, that is a slight exaggeration – but only a slight one. But for all my reading and rereading, I do not write for myself. No, I write in hopes that my novels will be read by others. I write in my journal for me. My novels? They are for my readers. Thanksgiving is a great reason to stop and think of all the things I’m thankful for. 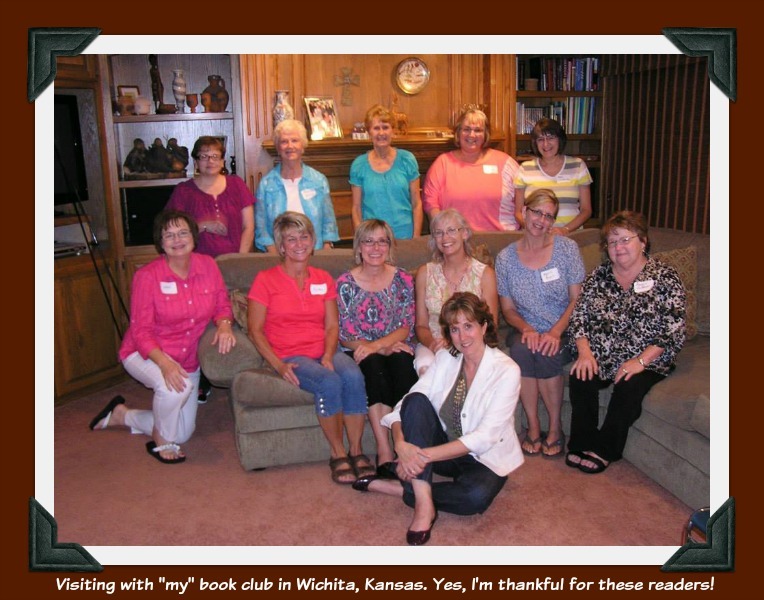 Today, I thought I’d share why I’m thankful for my readers. 1. Readers buy my books. Yes, this is important to me – and it’s important to every author. My publisher looks at my sales record when they consider offering me a new contract. This writing dream of mine? It’s also a business – and numbers do play a part. 2. Readers tell others about my books. For authors, word of mouth makes all the difference when it comes to connecting with new readers. Yes, I can tell others about my books. But when a reader tells someone else, “You should read Beth Vogt’s book!” – well, that’s huge. Think about it: when someone tells you that they like a book, aren’t you more inclined to give an author a try? 3. Readers share my books with others. It’s great when a reader loans my book to a friend. It’s even better when a friend buys an extra copy of my book to share. (See #1.) One year, a friend gave my books as Christmas gifts — and by doing that, she gave me a gift too. 5. Readers connect with me. I love hearing from my readers. That’s why I blog and why I’m on Twitter and why I have an author Facebook page. If I had to do it over again, I’d call my author page a “Reader Page.” It’s why I have a newsletter. It’s why I run contests whenever I launch a book – or sometimes why I have a contest just because I feel like it. I like to talk about books with readers – mine and other authors’ books. And I like to talk about life — the funny parts and the serious parts. Thank you, readers, for doing all you do to make writing worthwhile. As a reader, I can say that we are thankful for you, Beth! Love being able to read a great romance without cringing. Keep writing, please! I completely agree. I feel the same way about my readers. Well said! Thanks, Kimberly. I know I’m not the only author thankful for their readers! Yes, our readers do share their valuable time with us! It’s true — and I am thankful. And readers are thankful for you and your wonderful stories!